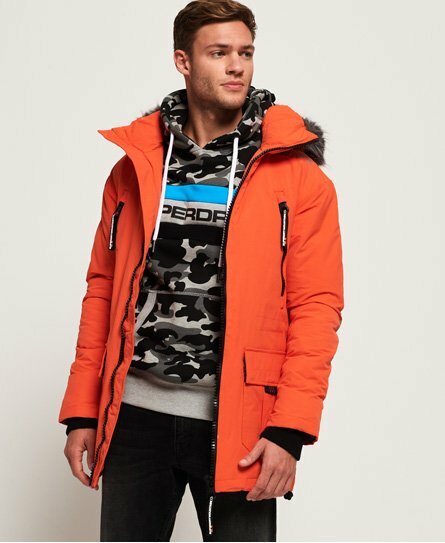 Superdry men’s Mountain pro project Down parka jacket. Stay warm in this parka style down jacket with an 80/20 premium duck down filling for fantastic insulation, keeping you warm in extreme cold with a very high fill power rating. The Mountain pro project down parka jacket features a removable hood with a bungee cord adjuster, four external pockets and one internal pocket. This jacket also features ribbed cuffs, a single zip fastening, and a reflective Superdry logo on the shoulder. The jacket has also been designed with a large reflective Superdry Mountain Project logo across each sleeve and along the back of the jacket so you can be seen in low light. For the finishing touch, the Mountain pro parka jacket has been finished with a Superdry badge on the pocket.